Anyone who owns, rents or ‘occupies‘ land has a legal ‘duty of care’ to take ‘reasonable steps‘ to ensure that the trees on their land are in a safe condition. Under the Occupiers Liability Act 1957/1984, anyone who owns, rents or ‘occupies’ land has a legal ‘duty of care’ to take ‘reasonable steps’ to ensure that the trees on their land are in a safe condition and do not place people or property at risk. In addition, the Health and Safety at Work Act 1974 requires organisations to ensure that trees under their care do not cause foreseeable damage to their employees or the public. Best practice guidance from the Government (HSE), National Tree Safety Group and Arboricultural Association advises that “trees subject to frequent public access – those that are closely approached by many people every day are regularly inspected and that records be maintained of all such surveys”. Should an accident occur, the ‘occupier‘ may be sued for negligence unless they can produce evidence of regular tree safety inspections and maintenance. 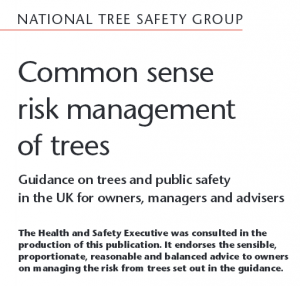 The NTSG’s publication Common sense risk management of trees, provide sensible and practical advice on what tree inspection should be carried out and what records are important to keep. Learn how OTISS makes it easy for landowners to fulfil their legal duty of care by following the current best practice. The current best practice guidelines can be summarised as follows. Carry out an overall assessment of the trees on your property. Divide the trees in zones, where each zones is assigned a risk category (e.g. high, medium or low). The ‘high’ risk category is recommended for ‘where there is frequent public access to trees’ (e.g. in and around picnic areas, schools, children’s playgrounds, popular foot paths, car parks, or at the side of busy roads). Detailed information about every tree is not required, but maps showing the locations of trees and zones are considered useful. For the trees in the high risk zones, a system of annual, formal inspections is appropriate. A less frequent programme of inspections is appropriate of the lower risk zones. These inspections should involve a quick visual check for obvious signs that a tree is likely to be unstable and be carried out by a person with a working knowledge of trees and their defects, but who need not be an arboricultural specialist. There are 1 day courses available to train people to carry out Basic Tree Safety Inspections. Professional arboricultural advice and assistance is required when defects or situations are found that are outside the experience and knowledge of the person carrying out the basic checks. It is important to keep records of when a zone or an individual tree has been inspected, along with details of any defects found and the action taken. Should it ever be needed, these records provide the ‘audit trail‘ that shows that you have fulfilled your ‘duty of care‘. OTISS provides estate managers with an easy and effective system to carry out this best practice for tree safety on their properties. Common sense risk management of trees, National Tree Safety Group, 2011. 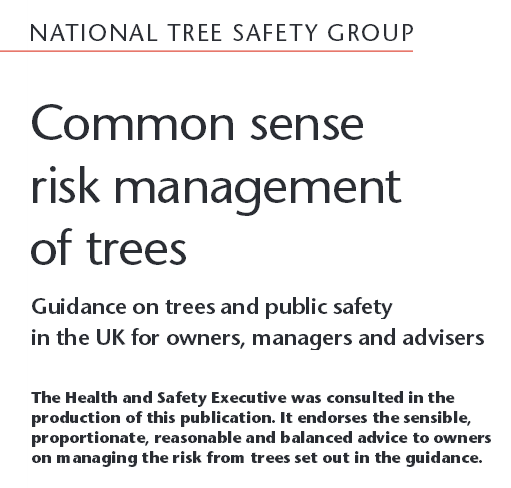 Guidance on trees and public safety in the UK for owners, managers and advisers. Common sense risk management of trees – landowner summary, National Tree Safety Group, 2011. The Visitor Safety in the Countryside Group provide information on Tree safety management which includes information on risks, responsibilities and good practice guidence. The UK government’s Health and Safety Executive (HSE) have published a circular on Management of the risk from falling trees. The Arboricultural Association’s website includes a selection of Guidance Notes, in particular “TREE SURVEYS: A guide to good practice“, Arboricultural Association Guidance Note 7. Tree Management Toolkit provided by Neighbourhoods Green. Greener Neighbourhoods good practice guide. Risk Limitation Strategy, London Tree Officers Association, 2008. The LTOA produced its first Risk Limitation Strategy 1992. It was a collaborative effort between tree officers and the insurance and loss adjusting sectors. It provides a frame of reference for dealing with tree risk.